Start The northwest end of Grass Lake and 1.7 miles west of Luther Pass. Powderhouse Peak is not an official name, but rather a name coined by tele-skiers to refer to the northwest peaklet of Waterhouse Peak. If Waterhouse is a magnet for tele-skiers, then Powderhouse is a super-conducting magnet; it is clearly the more popular of the two summits. The draw of Powderhouse is the steeper slopes, but its popularity assures that it will get tracked-out more quickly. As a result of it's popularity, parking at the northwest end of Grass Lake can be crowded when powder conditions are good; that's a good part of the winter since the north-facing, timbered slopes retrain powder well. But don't worry, there is lots of room along Grass Lake for everyone. The trees, though dense, are spaced wide enough apart to make a high speed descent fun, but not difficult. It's a place for short, fat skis. The average slope in the steep section is about 30 degrees making it avalanche terrain if it were not for the stabilization of the trees. That said, you should take suitable precautions when traveling in this area and be sure to stay out of the treeless gully marked on the map. From the trailhead (1) ski south for 0.6 mile until the terrain abruptly becomes more steep (2). Climb south for 0.5 mile until you reach the summit of Powderhouse Peak (3). 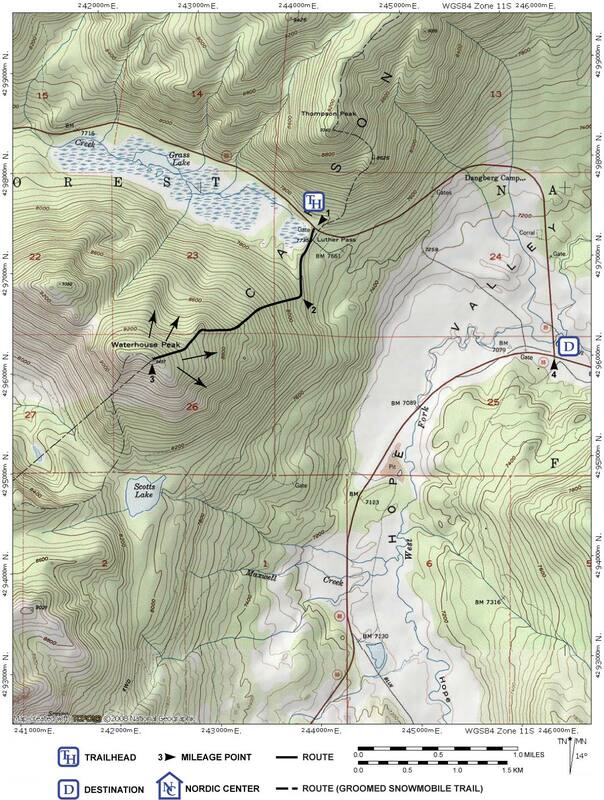 Descend for a total of about 1.1 miles north or northeast from the summit to Grass Lake and then back to the trailhead (1).